Weir Do and his super weird family are back again in the fourth book Super Weird. If you want some laughs then get hold of these crazy but funny books. This title introduces issues about nose hair, Mr Do’s nose and its strong sense of smell, apparent handicaps, pets and their look-alike owners, and small people with big dogs. There’s the usual stuff like snot, and dog saliva to add the oh, yuk! factor that kids love to read about and look at in books. Nothing is taboo in this series. Weir’s lack of height is the central theme that flows through this book. The ideas are linked and it is at the end that they all fall into place. Weir’s new dog FiDo is added to the Do pet family. He is very clever and has a knack for finding lost things in the weirdest places. FiDo and Blockhead the parrot bond immediately. They sleep, play and watch TV together. FiDo even teaches the parrot to imitate his bark, which is life-saving when Blockhead is lost. Funniest Pets is their favourite show but the two pets create far more entertaining scenes than anything shown on TV. Weir worries about his height. The tall boys make fun of him. He can’t reach his favourite snacks on the top shelf, or play basketball. He has a whole list of can’t dos. He’s even thought of using stilts to overcome what he sees as a handicap. Maybe start a little persons’ club? But smaller people are necessary too. Weir discovers just how valuable a small person can be during a rescue operation in a tight space. No one can take the Mickey out of themselves the way Anh Do does. His material is inexhaustible and carries a strong optimistic message about life and handling difficult situations. Perception is everything to his characters. Their shortcomings are considered as alternative ways of looking at life. Fun and laughter fills their lives. Strong family ties and support join the many positive themes. Helpful messages for children filter through all the weird and crazy things that appear in each book. I have a good laugh each time I read one. In fact I read them when I need a lift. A special mention must be given to the expressive illustrations by Jules Faber that contribute greatly to the success of this series. 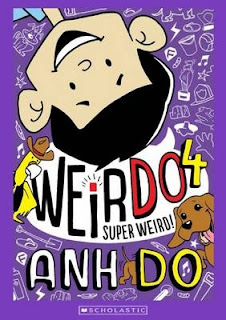 Earlier books in this series include WeirDo, Even Weirder! and Extra Weird!.